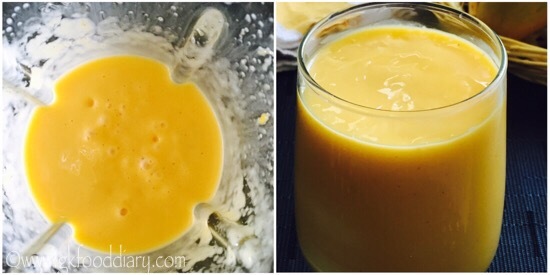 Lets get on to check how to make the mango milkshake for toddlers and kids. Wash the mangoes in running water thoroughly. Then place the mango in a cutting board with stem end down. Mango seed is in the middle. Cut along the sides of seeds down about ¼ inch from the center using a knife and flip the mango, repeat the same on the other side. Now you have 3 pieces of mango. Take a mango half, make lengthwise and cross wise cuts in it, make sure to not to cut the peel of the mango. 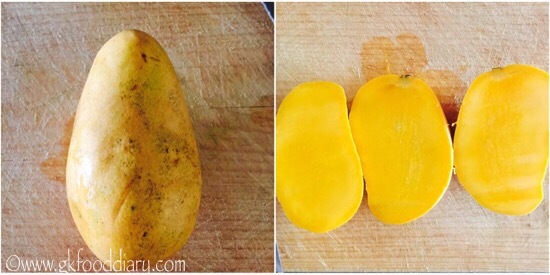 Invert the mango, cut the pieces through a small knife or collect the pieces with your finger. Repeat it for other half. Discard the big seed in the center. 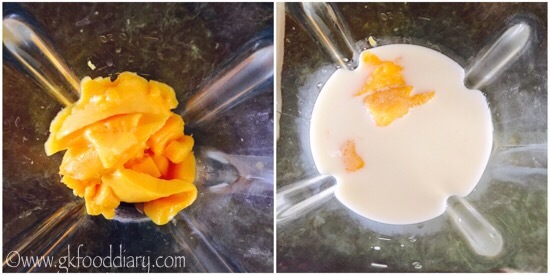 Now transfer the chopped mango cubes to the blender along with honey/sugar (if using),cardamom powder and chilled milk. Blend everything until smooth. Pour it in glasses and serve. 1. Wash the mangoes in running water thoroughly. Then place the mango in a cutting board with stem end down. Mango seed is in the middle. Cut along the sides of seeds down about 1/4 inch from the center using a knife and flip the mango, repeat the same on the other side. Now you have 3 pieces of mango. 2. Take a mango half, make lengthwise and cross wise cuts in it, make sure to not to cut the peel of the mango. 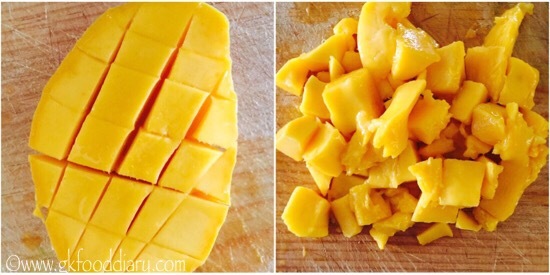 Invert the mango, cut the pieces through a small knife or collect the pieces with your finger. Repeat it for other half. Discard the big seed in the center. 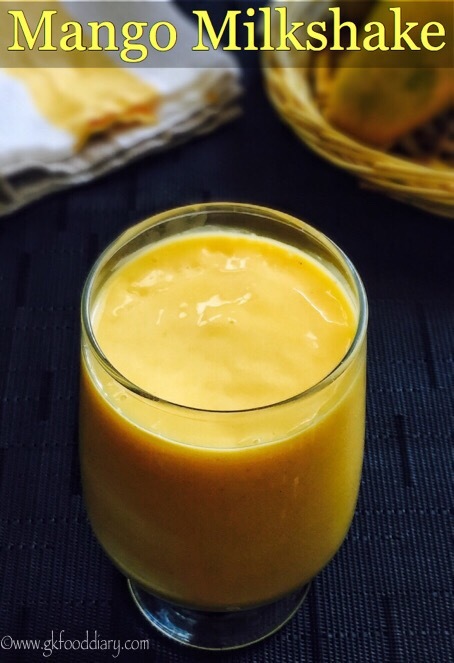 3.Now transfer the chopped mango cubes to the blender along with honey/sugar (if using),cardamom powder and chilled milk. 4. Blend everything until smooth. Pour it in glasses and serve. 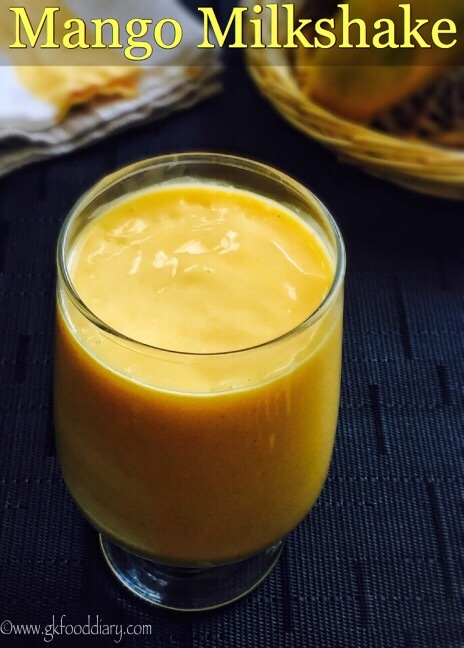 Serve the mango milkshake chilled! 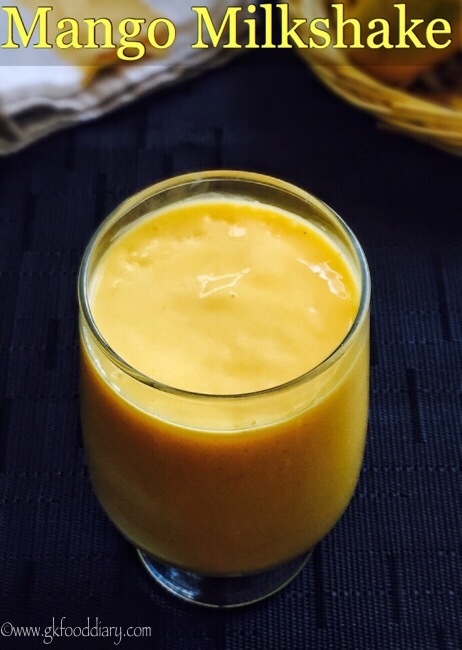 Adding cardamom to this mango milkshake helps in easier digestion and gives a nice flavor. 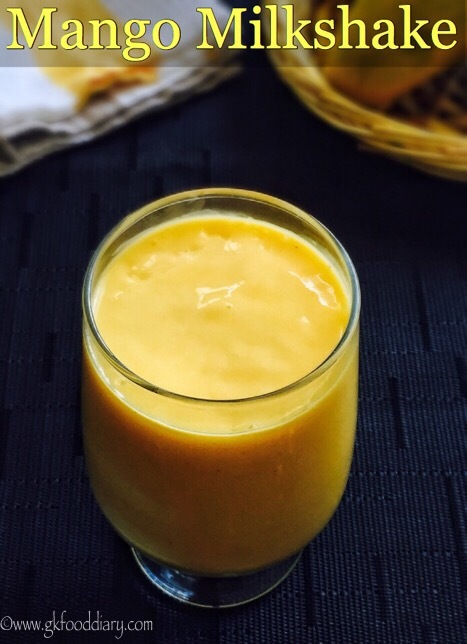 Make sure to introduce mango and milk separate before you try this mango milkshake to your baby. Skip honey/sugar if the mangoes are sweet enough. Always serve the mango milkshake fresh.